AUSTIN, Texas — For months now, professional sandwich chasers, John S. and Mike L., have been hot on the trail investigating sandwich crash landings in cities across the U.S. and sharing their findings with an audience of believers on YouTube. Their latest investigation has uncovered startling new evidence that reveals up to one million free sandwiches are on an impact trajectory heading for Earth. Alarmed, John and Mike are teaming up with Schlotzsky’s®, home of The Original® oven-baked sandwich and famous Fresh-from-Scratch® buns, to stop the takeover and are pleading for Americans to take action – now! How can you help? Join the revolution! Start by downloading the new Schlotzsky’s Lotz4Me™ Guest Rewards mobile app. This rewards you instantly for your courage – anyone who joins during the month of June will get one free small The Original sandwich (with purchase of chips & 32oz. drink). That’s one less sandwich headed for crash landing on Earth. Rewards and recognition: $7 off your order after your 7th visit (purchase minimum of $6 before tax). How it works: Purchase your favorite Schlotzsky’s meal. Use your receipt to earn a virtual punch. Once you’ve earned 7 punches, you’ll receive $7 off your next visit. You’ll also receive other great rewards based on how frequently you visit and interact with Schlotzsky’s. Exclusive “Insider” news &special offers: Members will receive special email offers and notifications, info on new products, special events and more! Social media sharing & referral bonuses: Register with Facebook and get one free punch! Then, refer your Facebook friends and you’ll get another free punch after they join and make a purchase! Guest feedback & surveys: Guests can provide immediate feedback through the app as well as provide input through surveys. Build an Army. Recruit your Friends on Facebook. As the leaders of the revolution, it’s up to YOU to fight off the sandwich invasion. Recruit your family, your friends, your Facebook friends, and get them to download the Lotz4Me Guest Rewards program. The more people who help us save the world from this million sandwich menace, the better chance we have to survive. Sandwich chasers John and Mike will continue to track the progress of the invasion and report on crash landings as they uncover them. To stay up-to-date on their video coverage, and meet the men behind this year’s biggest news discovery, tune into Schlotzsky’s YouTube channel, Facebook, Twitter or Instagram to follow their investigations. Are you ready to join the revolution to help save the world? Prove it. Download the Lotz4Me app from the iTunes or Android store today. Please visit schlotzskys.com for more information about the Lotz4Me app. By joining and using the app through Facebook, you hereby release Facebook from any and all liability in connection with the app. You also acknowledge that the Promotion is in no way sponsored, endorsed or administered by, or associated with, Facebook. You are providing information to Schlotzsky’s by joining the app, not to Facebook. 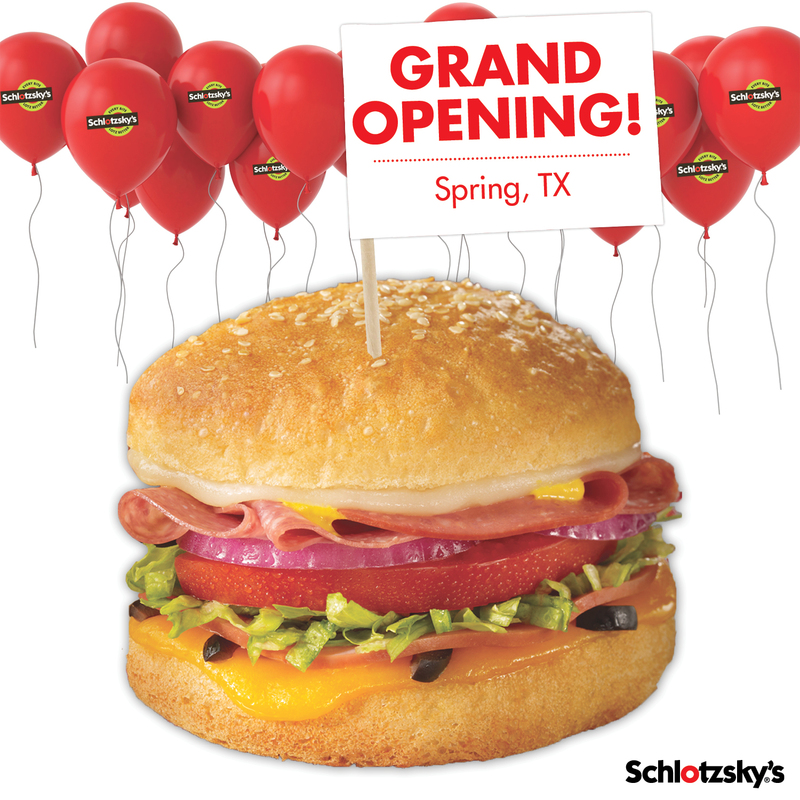 Schlotzsky’s AND Cinnabon are coming to Carrollton, TX! 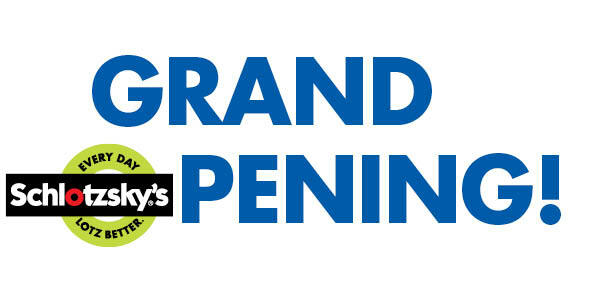 Grand opening celebrations kick off on Thursday, April 10. Join us for a ribbon cutting ceremony at 9am. Doors open to the public at 10am and the first 100 people to purchase a Cinnabon 6-Pack will get FREE Schlotzsky’s every week for a year! The event will feature lots of fun events, prizes, games and more!